On Sunday, April 28, 2019 from 1-2 the Hoffman Estates Historical Sites Commission will conduct guided group tours of the Greve Cemetery on Abbey Wood Drive in Hoffman Estates. Groups will be shown the interrelated Greve, Meyer, Ottman and Sunderlage pioneer families buried at the cemetery which is also known as Wildcat Grove Cemetery or Evangelical and Reformed Cemetery. The event is free but reservations are required. Tours will start at 1:00, weather permitting. Call Sue at 847-781-2606 for reservations beginning Monday, April 15. Tours are also available for small groups by appointment at other times. When: Sunday, October 21, 2018 at 1:00 p.m. Details: The new plaque, with corrections and additions, was made because of vandalism to the original plaque. Commission members will be on hand to talk about the graves. Our guest contributor this week is Pat Barch, the Hoffman Estates Historian. This column originally appeared in the February 2018 issue of the Hoffman Estates Citizen, the village’s newsletter. The column appears here, courtesy of the Village of Hoffman Estates. There’s a saying that what happens today is tomorrow’s history. But we always think of history as things that happened a long time ago. That’s the history we find so interesting. We have questions about things that happened in the past and the detective work that’s involved in finding those answers is what makes some of us history junkies. This past summer I received an e-mail from a Hoffman Estates resident about a very old tombstone she found amongst many things in her mother’s home. She was trying to take care of her mothers’ estate and didn’t have any idea as to what should be done with the headstone. It was a very unusual item to uncover amongst her antiquing mom’s collection. She wanted to know how she could find information about a tombstone that simply said “Wilson, December 20, 1856, 7 Yrs. 8 Mos.” This was a tombstone of a young child and she needed to find where this child was buried so the stone could be returned to the child’s grave. The first person I turned to for help was Jane Rozek, local history librarian at the Schaumburg Township District Library. She is a wonderful research librarian and I knew she’d be interested in helping solve the mystery of our resident’s tombstone. With the research tools available to her at the library, she began searching through census records for Schaumburg Township and finding nothing for a young Wilson, she went farther afield to seek help from Marilyn Pedersen, historian with the Palatine Historical Society. Marilyn said that the Wilsons were a prominent Palatine family. She suggested two books that might help in her search. The library has a great local history collection and the two books Pioneer Cemeteries of Palatine Township and Hillside Cemetery were on the shelf. Jane discovered that the tombstone belonged on the grave of Mary Emily Wilson who was buried in the Cady Cemetery of Palatine Township. Our Hoffman Estates resident was amazed that the young child’s resting place was found. She never knew how her mother acquired the stone she just knew she had to get it back to little Mary Emily’s grave. She called Terry Kelly, chairman of the Cemetery Committee in Palatine and they came out and picked it up with a promise that the Stonehuggers, a group that volunteers their services to repair and replace headstones in the old cemeteries of our area, would get it back to the child’s grave. It wasn’t until November 27th that she got word that Mary Emily’s headstone was put back in place. She went out to the cemetery. It was a very emotional visit for her. The peace and quiet of the old Cady Cemetery has inspired her to perhaps volunteer to plant some flowers or help in some way to maintain the cemetery. Her only sadness was that Mary Emily Wilson does not have her first name on the 1856 stone. This amazing story and the happy ending are due to good records kept by the Wilson family and the preservation of these records of the cemetery by the Palatine Historical Society. A missing piece of history was put back in place. It’s incredible that an 1856 headstone can be replaced in 2017. Mary Emily will have a few more visitors to her grave. She now rests in peace. The case began when a local lady found a tombstone while cleaning out her mother’s house in Schaumburg Township. The family moved here in 1965 and, in those early days, her mother enjoyed antiquing in the area. Along the way, she must have added the tombstone to her collection when it piqued her interest. Her daughter called Pat Barch, the Hoffman Estates Historian, and asked if it could be determined who the tombstone referred to. Pat gave me a call and I began my search–a bit dubious because of the commonality of the last name and the fact that there was so little to go on. I started with a wonderful website called findagrave.com. Entering the name, death date and the state, I pulled up 48 Wilsons who died in that year in Illinois. But none with the exact date. It also occurred to me that if this tombstone had been sitting in a house for the past few decades, it’s almost certainly not going to be on a website of tombstones! So, I tried another tact. From the data given, I knew the young person had to have been born in 1849 which means they might possibly be listed in the 1850 census. From there I went on the Ancestry database and made my way to the census for 1850. This time I entered the name, the birth year of 1849, the last name Wilson and the location of Schaumburg. I know from past research that, even though most of the area was occupied by farmers of German descent at that time, it was still early enough that the original English settlers could be found living in Schaumburg Township. Plus, there were always other non-German families who made their way to the area and rented farms or worked as hired hands. Unfortunately, there was no listing for a Wilson of that age living in Schaumburg Township. I expanded the search and took out the year 1849 so I could see if there were any Wilsons living in Schaumburg Township at that time. None. I went back to the first listing and discovered a “Mary E. Wilson” born “about 1849” who was listed in Palatine. The listing had one-year old Mary E. living with her parents Thomas F. and Mary A. Wilson along with her siblings: Eliza, Alonzo, Elizabeth, John, Charlotte, Abigale and Osker. Knowing that antiquing in the area in the 1960s, 70s and 80s would have had to have taken our local lady further afield than Schaumburg Township–not a lot of antique stores here–I figured Palatine might be a good possiblity for our missing person. It was now time to call the Clayson House in Palatine to see if they had any death listings for that time period. Fortunately Marilyn Pedersen, historian at the Palatine Historical Society, was there and she said the Wilson name was big in Palatine Township. She also recommended a couple of books: Pioneer Cemeteries of Palatine Township and Hillside Cemetery. And, fortunately, our library owns both books. The first book I looked at was Pioneer Cemeteries of Palatine Township and, amazingly enough, there was a listing for Mary E. Wilson on page 36 in the section on the Cady Cemetery. From the two pages on the Thomas F. Wilson (pictured to the left) family, it appears that most of the information is from the bible of Mary Angeline Wilson. Well, add five more days to that date and you have December 20, 1856, the death date of our missing Wilson family member. Everything fell into place. The Wilson name, the death date and the birth year. Case solved. Thomas F. Wilson buried members of his family in Cady Cemetery in Palatine Township on Ela Road although he, himself, is buried in Hillside Cemetery. 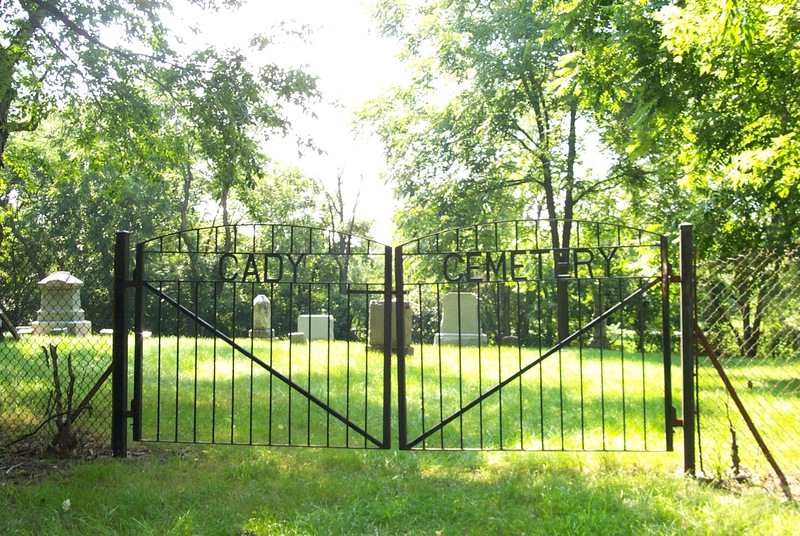 Cady Cemetery is in a bucolic spot and surrounded by a locked fence as seen above. As a result, I could not search for the Wilson family and take photos of the tombstones. I did find Coraet’s online and was able to post it. Soon, though, another tombstone will make its way there to its final resting place. Amazing to think that an 1856 tombstone has made it back home, thanks to great record keeping and electronic databases! 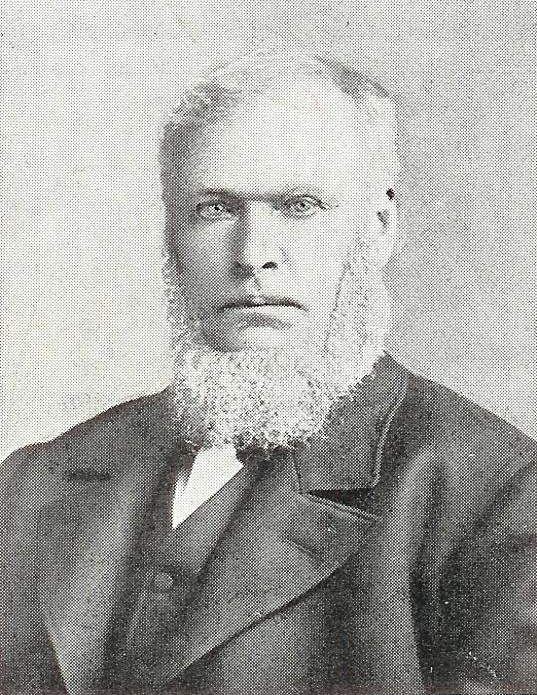 The photo of Thomas F. Wilson is used courtesy of the Palatine Historical Society’s website. 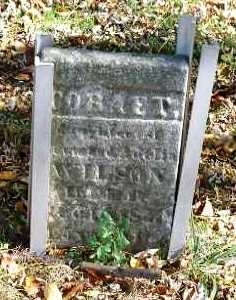 The photo of the tombstone of Coraet Wilson was found on findagrave.com and is used courtesy of the Barrington Area Library. Our guest contributor this week is Pat Barch, the Hoffman Estates Historian. This column originally appeared in the June 2012 issue of the Hoffman Estates Citizen, the village’s newsletter. The column appears here, courtesy of the Village of Hoffman Estates. At the top of the hill in the grove of old oak trees lining Abby Wood Dr. in Hoffman Estates, you’ll find the Greve cemetery, the final resting place of the first pioneers who settled this area. In 1842 Gerhardt Greve purchased 80 acres of farmland for $1.25 an acre and set aside land for the cemetery. When the first families arrived here, the area was known as Wildcat Grove, located near Higgins and Huntington Blvd. near Barrington Square. Higgins was then known as the Chicago to Dundee Rd. The headstones name many of those early settlers who traveled from the Hanover area of Germany arriving in New York in 1838. The Greve, Ottman, and Schierding families “traveled by Erie Canal to the Great Lakes, then to Chicago and then by ox cart to Salt Creek Precinct, this area, later in 1850 named Schaumburg Township.” J. D. Meyer, Gerhardt Greve and J. Sunderlage had come earlier in 1832 and returned later in 1838 with their families. In 1899 Gerhardt Greve sold the cemetery to Cook County for $1. An 1853 law allowed community cemeteries of less than 5 acres to be removed from the tax rolls, Gerhardt no longer had to pay taxes on the cemetery land. Never asking for help in maintaining the cemetery, the families continued to care for the graves and Cook County soon forgot that it was there. It wasn’t until the 1960s & 70s, when the land was sold for development and plans were made to build townhomes, that the cemetery was rediscovered. K & B builders of Barrington Square, were asked to set aside the cemetery land and in 1988, due to efforts of village trustee Bruce Lind, the land was deeded to the Village of Hoffman Estates. there is to plan on attending the fall Greve Cemetery tours on October 20th and 21st. Thank you to Nancy Lyons for sharing her knowledge and history of the Greve Cemetery with me. Our guest contributor this week is Pat Barch, the Hoffman Estates Historian. This column originally appeared in the February 2010 issue of the Hoffman Estates Citizen, the village’s newsletter. The column appears here, courtesy of the Village of Hoffman Estates! Tucked away in the heart of the village, in a shady grove of oak trees, you’ll find the cemetery that is the resting place of the first settlers to our area. 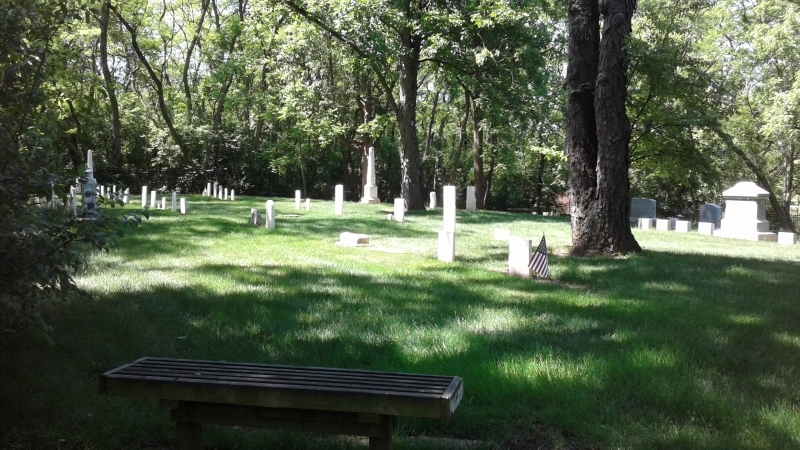 The Greve cemetery, named for the Greve family that set aside the land, has been preserved and is owned and maintained by the village of Hoffman Estates and the Historic Sites Commission. The early settlers, the Greve, Sunderlage, Meyer & Ottmann families, traveled along a dirt road that on early maps was known as the Chicago – Dundee Rd. (now Higgins Rd.) The large groves of oaks known as Wildcat Grove was the place they choose to settle in. The oak forest offered logs for the Greve’s first home and wood for the other families. A creek (Poplar Creek) cut through the countryside and the area offered the families the ideal location for homesteading. Johann Greve purchased 200 acres of land between 1842 and 1846 where present day Hilldale golf course is located at Higgins and Huntington Blvd. With the death of the Sunderlage’s baby son John in 1846, cemetery land was chosen on a small hill amongst the towering oaks. As the years went by, other children, parents and grandparents where buried in the small cemetery. Neighbors from the area also were buried there. Ministers from the United Evangelical Congregation at Wickleffe (now the intersection of Algonquin Rd. and Roselle Rd.) presided over early burials. The small congregation was first established in 1846 and built its first church in 1850. Now known as St. John’s Church of Christ, the congregation recently celebrated its 163rd anniversary. Over the years the families maintained the cemetery with frequent visits and family picnics that also served as reunions and a time to plant, weed and tidy the cemetery grounds. 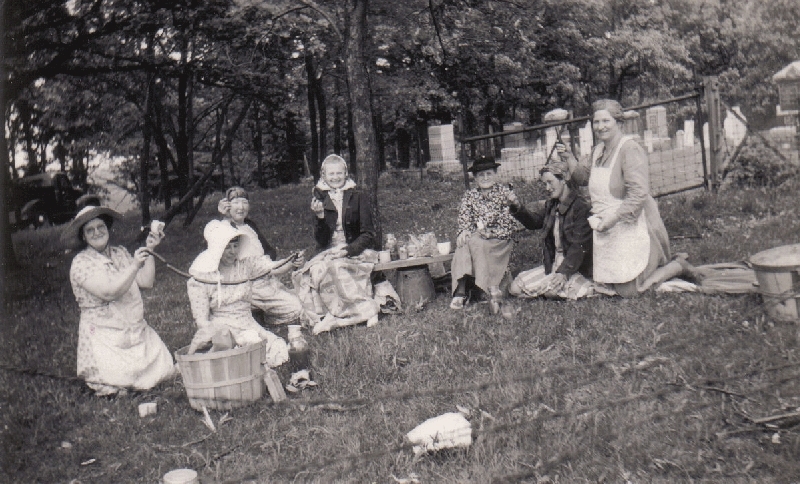 Old snapshots from the Meyer family, dating back to the 1940s, show the women visiting and cooking up some sausages for the picnic. With few family members left to care for the grounds, the peaceful cemetery has experienced vandalism to the headstones and grounds. Some headstones have been deliberately damaged or even stolen. The Greve cemetery is now fenced and the gates kept locked to protect the graves of the early settlers. 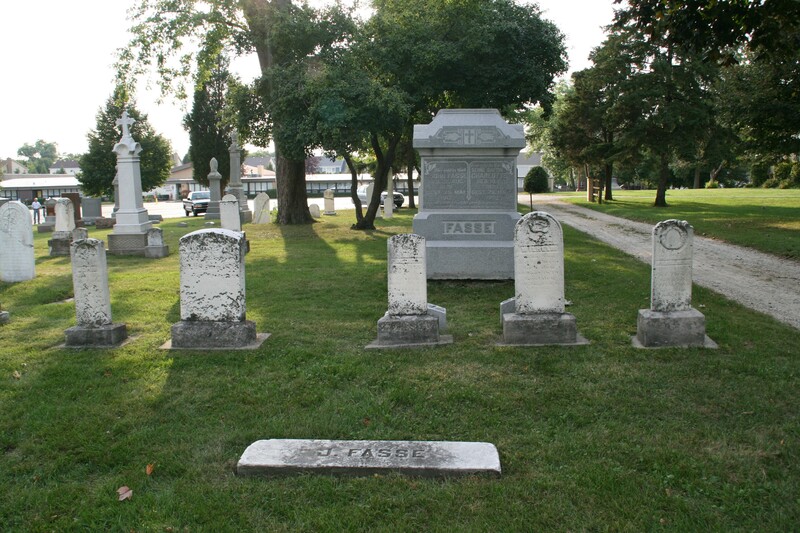 This spring the Historic Sites Commission will work with the Hoffman Estates Public Works Department in an effort to restore and repair the damaged headstones. The HSC is also planning several small tours of the historic cemetery. Plans are for a tour in April and another in October, 2010. If you’re interested in seeing the Greve cemetery, please contact the Hoffman Estates Village Hall for further information at 847-882-9100. 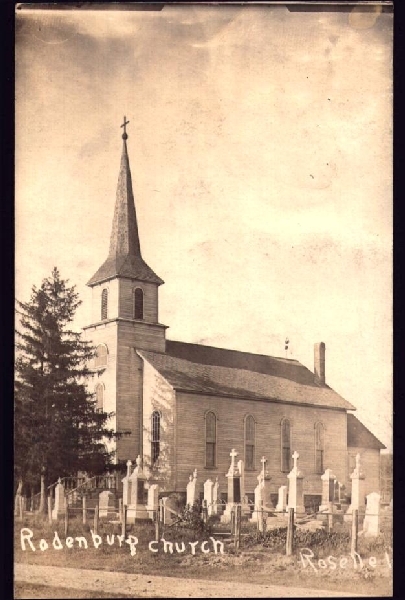 St. Peter Lutheran Church formed what is now the largest cemetery in Schaumburg Township shortly after the founding of their congregation in 1847. Originally, the cemetery was laid out in sections of 12 graves with a stone border marking each family’s plot. Each plot is separated by a pathway. Families were given free choice in the placement of the graves in their plots. The first burials took place in 1847. Some of the stones had birth dates in the 1700’s and show the individual’s birthplace as Schaumburg, Germany. More than 1000 graves can be found in the cemetery. Many of the founding families of Schaumburg (Rohlwing, Quindel, Nerge, Lengl and Winkelhake) have members buried there. To view many other photos of St. Peter Lutheran Church, go to the Local History Digital Archive. Browse through the Photos by looking under Places and then Churches. You might also want to take a look at the Cemetery Records of St. Peter Lutheran Church Cemetery, Schaumburg, IL or Larry Nerge’s update of Cemetery Records of St. Peter Lutheran Church Cemetery, Schaumburg, IL or St. Peter Cemetery Grave Locator. These are all available in the Documents portion of the Local History Digital Archive. This photo shows the second St. John Lutheran Church with the cemetery nearby. It’s location was across the street from the fourth and current church which is located at 1800 S. Rodenburg Road in Schaumburg. The first church was erected in 1851 by German settlers. The original congregation was comprised of members who found it difficult to travel the distance to St. Peter Lutheran Church. The charter members of the church were: Christoph Steffen, Heinrich Hasemann, Friedrich Hinze, Heinrich Mensching, Christopher Ackmann, Conrad Dralle and Conrad Geistfeld. In 1859, St. John’s joined the Missouri Synod and not long after it was decided that a new church was needed because of the growing congregation. This second church was dedicated on December 16, 1863. The earliest burials recorded in the cemetery are from the 1860s. The date of the photo is unknown although the next church was constructed on the same site in 1911 after this one burned down August 23, 1910. It should also be noted that the area near this church was commonly known as Rodenburg, named for the area in Germany where many of the original church members were from. Located in what was once known as Wildcat Grove, the Greve cemetery is off of Abbey Wood Drive near the Highland West subdivision in Hoffman Estates. Johann Gerhard Greve and his wife Sophia Charlotte, who came here from Germany in the 1830’s, started the cemetery in the 1840’s. Other family names found here include Meyer, Volkening, Wilkening, Ottman, Schween, Dammerman, and Sunderlage. In 1971, development of the Barrington Square town houses threatened the existence of the cemetery. A fight led by Marilyn and Bruce Lind forced the developer to maintain the cemetery’s location. Mr. Lind, a former Hoffman Estates Village Trustee, who died in December 1991, is the last individual to have been buried here. To view other photos of Greve Cemetery, go to the Local History Digital Archive and Browse through the photos to Places. Click on Cemeteries – Hoffman Estates. Or, take a look at some of the Greve Cemetery documents by Browsing through the Documents. Tucked away on a side street in Schaumburg, is a small lot that houses a cemetery used by the very early residents of Schaumburg Township. 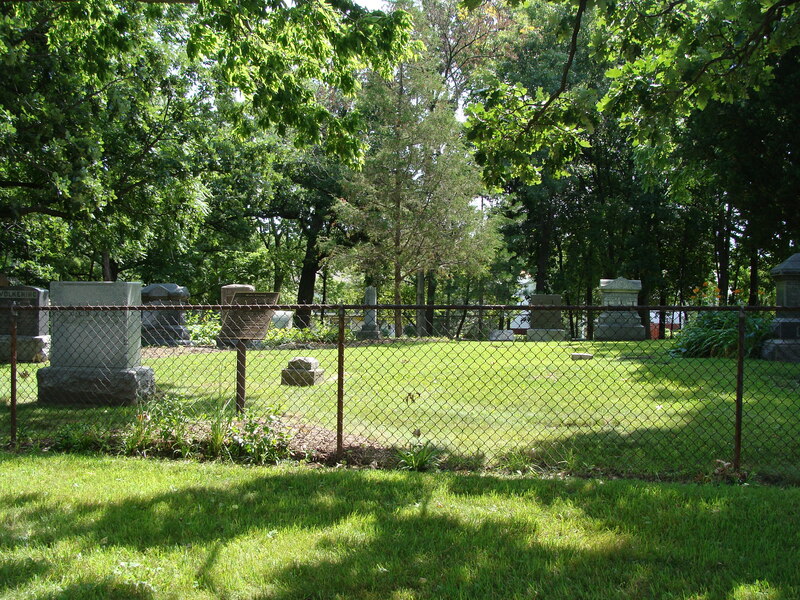 This cemetery is located at 217 S. Cedarcrest Drive in the Timbercrest subdivision in Schaumburg. You won’t see any remaining gravestones but the location is well known by former residents. 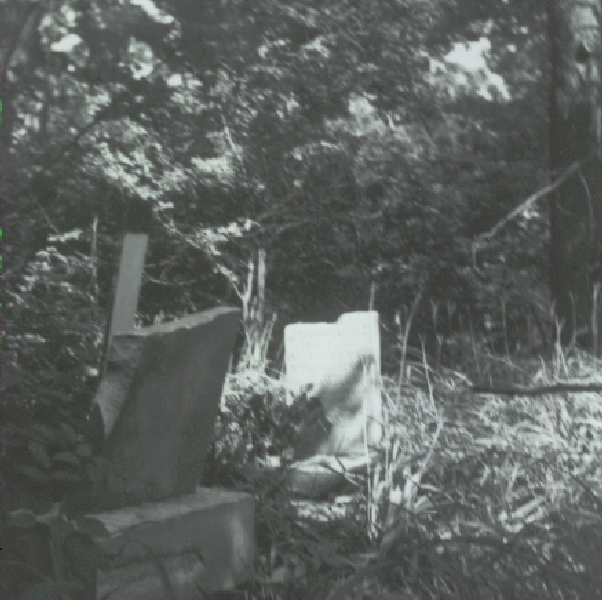 To the left is an early photo of the cemetery before the property was cleaned up. The cemetery has gone by many names: Schween’s Grove Cemetery, Timbercrest Cemetery and the Cedarcrest Cemetery. It is known that the family of Ernest P. Schween, one of Schaumburg Township’s original land owners, used this site as the location of several burial plots during the mid-1800’s. Katrina (Ottman) Schierding, wife of Phillip Schierding, was one of the first buried there. Their daughter, Mary Schierding, married Ernest Schween. View another photo of the cemetery on the Library’s Local History Digital Archive. Browse through the Photo category under Places. Or, try watching the video, “217” prepared by WGN reporter, Marcus LeSchock while he was a student at NIU! Browse through the Video category under Documentaries to find it.